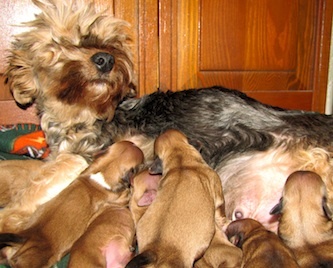 It is really hard being the father of seven; it all happened on the same day. Dakota, the boss of all of the animals on the Red Fence Farm fathered 4 boys and 3 girls on December 20, the day of the Winter Solstice, also the day the moon experienced a total eclipse. The anticipation, the waiting, the worrying. It was stressfull on Dakota. 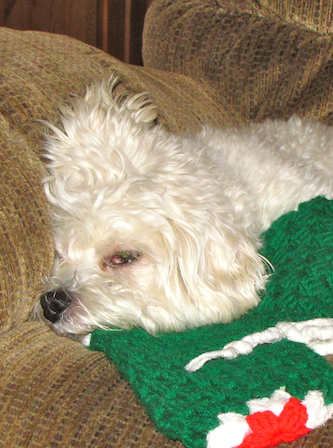 On the other hand, some might say, Dakota had it easy and the focus and attention should be on Bella the "Wonder Dog". Bella may be the best mother in history. She is sweet, tough and raises about the best puppies in Alaska. You can tell from the photo that she has the Phyllis Diller look but what do you expect, she just delivered seven healthy babies. 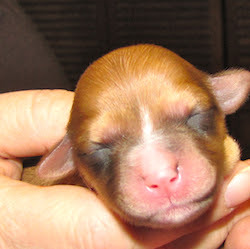 This is a photo of 2-day old "bruiser". He is pretty, cute, well groomed, pink, big eared and always the first to the teat. We think he will really be a player once he gets his eye-sight. This is what the Henry Family does when not working our regular jobs, raising goats, horses, chickens, ducks or building Henry Milkers. Wow! I can't wait to see pictures in about 4 weeks when these little guys are running all over the place! Dakota, move over! Here comes Bruiser!